I’ve talked to a lot of nurses lately who feel pressure to go back to school and make more money with an MSN of some sort. Obviously, universities are all about the chance to get a few more years of tuition from them. There are other options besides heading back to the classroom, and one of the most flexible, lucrative, and terrifying is nurse entrepreneurship. Going at it alone is a common response to burnout or an unfulfilling career, but results may vary. If discouragement at work is why entrepreneurship sounds appealing, check out the FreshRN® posts on bullying and stress. On one end are Multi-Level Marketing health drinks and essential oils that cause your former friends to flee in terror when they see you coming. I kid, they are a valid option and definitely have their place if you can find your niche and avoid becoming a social pariah. Close enough. We’ll start our discussion at the other end of entrepreneurship: new ideas and inventions incorporated into a stream of business income. For example, you could invent a capcaicin-based lotion for children to decrease pain from injections and IVs or a travel pillow that diffuses lavender and magnesium—perfect for the next Greyhound bus trip so you won’t have to pack a pillow, Benadryl, and Febreze. In between are content providers and entrepreneurs like Kati and her insightful posts about blogging and not being a sucker. Nursing school doesn’t include entrepreneurial training, while chiropractors and dentists are more accustomed to starting their own businesses. Massage therapists and similar occupations can have fairly limited income potential unless they launch their own businesses. I don’t consider myself an expert, but I’m currently on my fifth or sixth business, ranging from my writing and speaking careers to alternative medicine services, to my latest venture, a Ketamine clinic for anxiety, mood disorders, and chronic pain syndromes. For an example, specific to my specialty, starting a small anesthesia practice with a few buddies is a great plan. You just need a gastroenterologist or ophthalmologist, knowledge of your state’s nurse practice laws, and you’re all set. This will sound shady, but the fewer laws, regulations, and organizations you are at the mercy of, the better. Problems start when insurance companies delay your payments for six months because they need to reach an arbitrary 20% claims denied quota. If you have a spouse making a steady income, there’s more flexibility to earn profits and make mistakes on your own. I don’t recommend this approach if you’re still in debt from nursing school, even though it’s quite possible to start a business without thousands of dollars. Since additional licensing, oversight, and paperwork all increase the amount of time spent on a business without making money, start small and keep your day job if possible. You’re the boss. Money up front can help you scale faster, but relative obscurity allows you to fine tune (screw up) before there’s serious money and reputation on the line. Figuring it out as you go along is only advisable in those gradual cases. Consulting an attorney, accountant, and the like is wise if instead of making ugly badge holders (sorry Sharon, no one wants to wear the tops from twenty Propofol bottles), you’re starting a PPE company replacing masks, gowns, and hoods with ultraviolet carbon polymer shielding. In that case, clients want to know you’re an actual business, while in many others they won’t care. Of course, if you don’t know anything about the process of starting or running a business, it’s difficult to delegate or assess the quality of service a bookkeeper or business expertise service offers. Let me tell you how I do it, though the companies I’ll mention are just my somewhat random preferences; also do your own research. For my state of Florida, once a hobby is profitable enough that I want some tax deductions and legal separation from my personal assets, I visit sunbiz.org and register an LLC for $125. You can do the same with a physical Florida address, even if you don’t live there, or follow the process in your own state. Next, I register directly with the IRS (LegalZoom not required) to get an EIN—basically a social security number for a business–and fill out Form 2553 so they’ll treat my new company as an S Corporation. This just means I owe fewer payroll taxes. There are plenty of boring articles on the Internet about the pros and cons of different setups. Either way, I can create my own retirement plan on Fidelity or another broker and add other benefits just like a big company. When I get new tags for my car every year, I also renew my business licenses in the county where I live. Conventional advice is that you immediately need a business banking account. Remember that no one makes money off you if you do things simply, so Googling this topic reveals all sorts of recommended fees and licenses and busywork. However, it helps me stay more organized and less likely to use business funds for personal expenses and vice versa if I have a separate account, so I usually get a business savings account at First Internet Bank, since the interest is above 1% and there aren’t any fees if I keep my balance above $1,000. I budget with a program like YNAB and buy business tax software at the end of the year from TaxAct for about $30, though I tend to call their helpline often since, again, I’m not an expert. Let me know in the comments if you’d like more info on investing or starting companies that do require significant amounts of money, and I’ll explain further. Is it lucrative to start playing for the other team? Many physician practices have abandoned the insurance model for complementary and alternative medicine cash practices centered around supplements and nutraceuticals. There’s a long continuum between fraudulent and fantastic. If this is a topic of interest, useful alternative medicine clinical skills should be a priority, but you need to research what falls under your scope of practice. A nursing license has more credibility than a string of letters following your name that probably stands for “I Picked up a Degree in Holistic Feta Cheese Management at the International Deli.” Before you drop everything to run a hypnosis studio in your parent’s garage, realize that the spiritual dimension is very important in this line of work. Some people have values that run deeper than even a Snapchat filter, so reflect on why you believe those fabulous quotes that resonate with your soul on Instagram. Transporting yourself back to the secular world, insurance rates differ widely depending on the potential consequences of your business. If you have a small side practice doing something boring, they won’t be interested in you. A budding herbalist taking the types of patients Western medicine can’t do anything more with needs to spend some time assessing liability. My point? Find your niche, and work tirelessly until you achieve it. Love or greed won’t be enough to excel. Facing your fear, which for me is usually rejection and failure, may prove lucrative as you shape your dream job into what people are willing to pay for. So maybe you’d like to stick closer to your regular job rather than inventing ultrasonic bathtubs (think BathFitters meets ESWL). The perspective of an outsider might be enough of a change to let you stay employed in the hospital setting. I was a self-described nurse hobo for years. I never hopped on a train between jobs or split wood for spare change, but there was plenty of couch surfing and penny-pinching during my agency days. The best part of contract work is going to work purposefully, because it’s your choice, as opposed to dragging yourself there because the schedule demands it. I admit; the difference is mostly psychological. Occasionally, this meant I worked more shifts than were good for my health because I was unsure when the next opportunity would come my way. This uncertainty is part of entrepreneurship even if you’re just selling aged cheeses during your lunch break (I’d advise working on that lavender essential oil pillow simultaneously, though). Working at a higher rate of pay but with a sporadic schedule is only an advantage when there is something valuable to do with time not spent working. For me it was studying, for you, it might be a side gig or seeing those kids you made before starting school. In some ways, this is the opposite of the usual start-up experience, where part of the reason to budget is to make sure you’re making more than $2 an hour spending all that time knitting poop emojis for your Etsy shop. So stupid when you think it through, right? I’m trying to avoid all them slick business words, but “hustle” has been maligned just like sweet, innocent MRSA and tertiary syphilis. You have to take breaks, or even as your own boss you’ll suffer burnout like the nurses who can’t take all the bureaucracy that prevents them from providing the best care for their patients. Many people who start a business just because they didn’t want anyone to tell them what to do discover that debt, customers, and even competitors do exactly that. Hard work and determination is a must for any business to succeed, but the equation is more complicated than luck and willpower. Otherwise, people wouldn’t have garages full of unsold Tupperware. A very slim minority—no, seriously, those shakes actually worked for them and they’re slender now–can succeed while others tread water at best, but successful entrepreneurship requires the ability to look at personal situations objectively. “Can I salvage this by working harder?” “Do I need to pivot in a new direction, and can I do that quicker than the cash-loaded companies I compete against?” Serial entrepreneurs simply try to sell their business before they run themselves into the ground, but starting a business you might eventually pass on to your children tends to be a more sustainable route. One investment burned me because the company hoped a bigger company would acquire them before they had to do anything crazy, like rent factory space and make their actual product. Oops. What questions do you have? Hustle is an important facet because sometimes we work hard for the sake of working hard. You’ll just be spinning your wheels unless you can make personal connections with potential customers. I mean, unless that Etsy store sells hand-knit scarves resembling VRE under the microscope because I don’t care who you are, I’m buying that, especially if it comes in Isolation Gown Yellow. This course walks you through the essentials of digital marketing and show you how to build a strong online brand with a blog as it’s centerpiece. You need to know the rules, the tricks, the short cuts, and the “must dos” to save yourself thousands of hours. You chose nursing because you wanted to make a different. You’ll pursue blogging because you need to be relevant to make a difference. 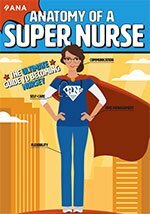 Take the Nurse Blogging 101 course! Nick Angelis, CRNA, MSN, is the author of How to Succeed in Anesthesia School (And Nursing, PA, or Med School) and regularly writes or presents continuing education articles on a variety of dry and dreary topics, just like this one. He also has a thing for satire such as The Twerk Vaccine. Nick works as a nurse anesthetist in NW Florida and NE Ohio and enjoys playing several sports poorly. You can connect with him on Linked-In, Twitter, or Instagram.